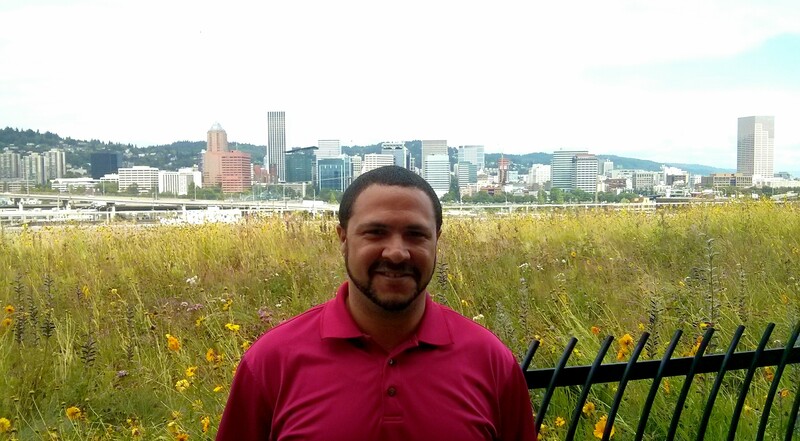 Last week, we sat down to chat with Ben Duncan, founding board member of OPAL and the Chief Diversity and Equity Officer at Multnomah County Health. Ben graduated from our Create a Commuter program over a decade ago, and shared with us his thoughts on the importance of having access to active transportation. What year did you earn your bike through the Community Cycling Center? Can you share a bit about your experience with the program? It was 2003, so my memory is probably a little bit scattered from that time. I was doing an AmeriCorps program, or “Ameri-Poor,” as some people might say. I had a car at the time and it wasn’t working very well, so I wasn’t able to drive it. I used to return bottles to get bus fare in the morning. Transportation was a real challenge. I was also doing my AmeriCorps out of WSU Vancouver so I was taking a bus from SE Portland. There weren’t very many options to get there, which meant that all of my transportation dollars were being spent on the bus to and from my AmeriCorps service placement. All of my other transportation ended up being by bike or a combination of bike and bus. AmeriCorps created the connection to the Create a Commuter program. We had a whole team of folks that were able to participate in the program and get access. I grew up riding bikes but not as a commuter. At the time, I really wasn’t using bikes as a transportation option at all. It’s been over a decade. What do you remember about the Create a Commuter workshop? I don’t remember a lot about the workshop or the lessons, to tell you the truth. What I really remember is that I was like a kid opening a Christmas present at the end because I had a bike with all the bells and whistles: lights, fender guards, and a helmet. I remember riding around the neighborhood as a group, learning some kind of basic maintenance and putting a tire on, which I had never done. What I took for granted throughout my life was both the simplicity and the complexity of a bike and the maintenance of it. It’s hard to remember the workshop itself, but it’s a bike that I still use. I haven’t upgraded and I don’t know if I ever will. I still ride it. Why do you think programs like Create a Commuter are important to our community? When you have limited options, being able to be provided something that you know you couldn’t afford otherwise, or that you may not have seen as an option, there’s a real value there. I think about it in terms of transit justice; the idea that bikes empower you to be able to navigate the places and spaces that you want to and provide some freedom that you otherwise wouldn’t have. I don’t need to walk through all of the environmental benefits of bike riding, but for me it was an option that I so appreciated. I think of those memories of making so little money, just barely getting rent, and using EBT cards to try and get enough food for the month. I was in a different place at the time than a lot of other AmeriCorps members. It’s about that empowerment piece. It lets you have a space to do what you need to do. You’re involved with OPAL and Multnomah County Health. Tell us a bit about your role with each organization and what key issues you are working on today. I was a founding board member of OPAL. I’m still a member of the board going on ten years now. We started around air quality. As we were knocking on doors, people really identified transportation as a key issue. So we’ve spent a few years mainly focusing on public transit – bus riders and transit dependent. A lot of folks are using both bikes and the bus as a combination transportation option. Here at Multnomah County Health, I’m the Chief Diversity and Equity officer and Director of the Office of Diversity and Equity. I spent most of my career in public health. I think environmental justice and health equity are really connected by theory and by model. It’s been about access, it’s been about inclusion, it’s been about disparities and the ability to reach your potential. In public health, we talk about healthy food and we talk about people who are taking three bus trips to get to the grocery store to buy a week’s worth of food. We hear about people who, because of the lack of transportation, can’t see their parents or can’t go to after-school activities or any number of things that prevent people from having access to opportunities. My role is to make those cases for each of those organizations, and to make the policy suggestions and recommendations. I help frame why these things are critical and how they’re interrelated. Do you have any final thoughts on Create a Commuter? As far as Create a Commuter, I really appreciate the approach of the Community Cycling Center. Bicycling in Portland has been kind of owned by white, middle class, mainstream, enviro kind of folks. I think that’s changing, and I think the Create a Commuter Program is one of those types of spaces that is actually moving us in a more positive direction: being more inclusive, more accessible, and redefining who rides bikes and what bikes are used for. I was reading an article, maybe by the BTA folks, and they were talking about the overlay of biking and transit. In order to be a good bike advocate, you should be advocating for good public transit for a variety of reasons, but it keeps people out of cars. That really creates a culture of getting out of your vehicle and finding other ways to move through the city. For me, those are they types of things that are opening up new doors for new conversations and new avenues for relationships, which for me is really exciting. Since I was engaged in Create a Commuter, I’ve peripherally watched the Community Cycling Center grow as an organization. I think having someone like Mychal as the CEO, not only is he a really talented person and kind of came up through the organization, but it’s a statement to the community about being more inclusive and about expanding the ownership over what cycling is, who cycles, and what ways they use a bike. The idea that we can get more people doing that is pretty exciting.